This blog post first appeared at InterACT (10/9/11). You might want to see the original post in order to read the comments. One of the most important guiding principles in education is in loco parentis – we are morally and legally obliged to act “in place of the parent” when children are in our care. That principle is the main reason for the sharply negative and visceral reaction I had when I read about John F. Kennedy High School using color-coded identification cards based on student test scores, and then a later article describing a similar program at Cypress High School (both in Orange County, California). According to the Orange County Register, the different cards also led to different privileges around school, discounts on various purchases, and even led an administrator to insult a group of students in an assembly. The policy has sparked debate and quite a bit of criticism online (and in rather short order, the district announced that most of the discriminatory practices would be ended). Anthony Cody wrote about it in his blog and I left some comments there and on Twitter, and the topic has been actively discussed on Huffington Post as well. Acting in loco parentis, I try to remind myself that I have responsibilities to “Every student, every day.” In the photo above, you can see one of the locations where I gave myself a visual reminder of my mission. I have so much trouble with a school policy that treats not just some of its students, but the majority of them, as second class citizens. That’s far from the democratic ideals that should infuse our schools, and far from good parenting. The problem that the policy aimed to solve was that some students were not motivated to do their best work on state tests, and therefore the school’s Academic Performance Index was lower than it could have been. Other schools have ways of motivating students, ranging from innocuous (a treat) to inane (big rallies and assemblies). But of course, the school has no way of measuring effort, and must assume that many students putting forth their best effort will still come up short; using the negative motivator of shame will not help students already giving their best effort to somehow muster more effort. 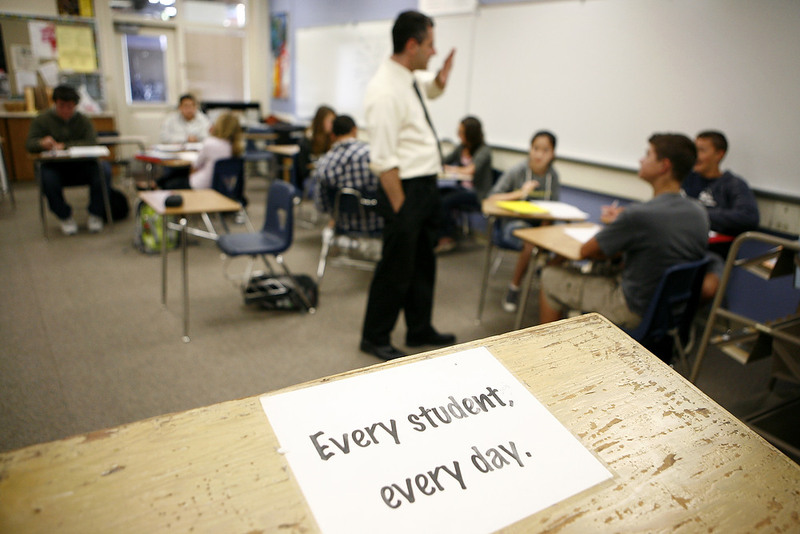 For students who still miss the state’s “proficient” mark on this single test, Kennedy and Cypress high schools are content to relegate them to lower status in multiple daily interactions with their peers and the school. There were predictable results (detailed below), including insults and discrimination, but apparently the school valued its Academic Performance Index more than it valued the mental health and wellbeing of the majority of its students. I’d have thought the policies were so obviously wrong, so insensitive, so counterproductive and so poorly aligned with what we know about motivation and performance, that it would almost be unnecessary to write a blog post about the incident. I’m glad that Anthony Cody did, but I didn’t think I’d have much more to contribute. Until I mentioned eugenics – first on Anthony’s blog, then on Twitter. In a series of exchanges with someone I respect, I was repeatedly challenged on my claim that this policy had connections to eugenics. So here we go. First of all, let me be clear. I don’t think the intention of the policy was eugenic; I do not claim that the administrators believe human intelligence is immutable, or that they had any thoughts about trying to control human reproduction in order to pass along the most desirable genetic traits and thereby improve our “racial stock.” In fact, most adults I know, in the field of education or not, have very little awareness of the eugenics movement, and were it not for my own learning over years of contact with Facing History and Ourselves, I probably wouldn’t know it either. So, I’m not accusing these administrators of being eugenicists or actively supporting eugenic goals or beliefs. I’m sure they are decent people with good intentions. They made a serious mistake. The range of actions and understandings with which all of us operate come from somewhere. We are the inheritors of a complex history, some of it quite negative; the heavy stone of the American eugenics movement may have sunk to the bottom of the lake, but the ripples travel on whether or not we recognize their origin. Perhaps without knowing it, these schools are carrying out policies that constitute yet another ripple from a rock they didn’t see hitting the water almost a century ago. Some people will read this and say I’m going too far in pursuing this line of thinking. However, a colleague I know who has studied this history extensively would say that I’m barely scratching the surface, and that evidence of eugenic influence can be seen in our overall testing policies, including high school exit exams. Take a look at who ends up in continuation high schools, who ends up dropping out, and my colleague would tell you that all schools are still immersed in the legacies of eugenics in ways we rarely consider or confront. I’m inclined to agree, but for now, will try to use this one example to make the point. Maybe then we’ll have a foot in the door to look beyond these schools. Eugenics was accepted science in the early twentieth century. Armed with a rudimentary understanding of inherited characteristics and evolution, scientists, legislators, educators, clergy, the military, and many others in society looked for ways divide people by their qualities and even guide human reproduction at the societal level, just as farmers would try to improve crop yields and livestock through a selective process. County fairs and exhibitions around the country offered scientific displays showing the threat of higher birth rates among the lower classes of society, and they held “Fitter Family” contests to identify and extol the ideal characteristics of those who should procreate and pass on their genes. Tens of thousands of Americans were deemed unfit to reproduce and sterilized against their will or without their knowledge, a practice blessed by the U.S. Supreme Court in Buck v. Bell. 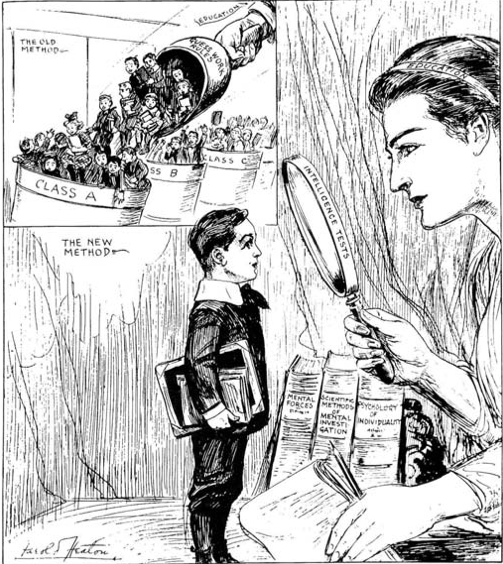 In the field of education, intelligence tests promised an era of scientific efficiency, as each child could be provided with the education befitting the intelligence displayed on a single test taken at an early age. Regarding those children with the lowest measured intelligence, eugenicist and professor Lewis Terman wrote, “Children of this group should be segregated in special classes and be given instruction which is concrete and practical. They cannot master abstractions, but they can often be made efficient workers, able to look out for themselves. There is no possibility at present of convincing society that they should not be allowed to reproduce, although from a eugenic point of view they constitute a grave problem because of their unusually prolific breeding” (“The Measurement of Intelligence” pp. 91-92, 1916). One test, separate treatment, and a heavy dose of judgment regarding who deserves basic rights – those are parallels that are hard to deny in the present case. Take a look at the illustration below. In the upper left corner we see “THE OLD METHOD” where schools must use guesswork for sorting students into different classes. “THE NEW METHOD” is the use of intelligence tests, in the hand of a gentle but authoritative education system. Random guesswork is now out, but the goal has not changed; students will still be sorted into classes, only now with greater certainty. In an era where eugenic thinking ruled the day, the sorting of students into separate classes was an assumed good, a benefit to society. The faith in the tests was firm, though by modern standards they were clearly riddled with cultural biases. For example, the test might require a person to recognize what was missing in a simple line drawing of a known image – for example, a face missing a nose. Although, if you immigrated from a landlocked nation, you might not recognize a crab at all. If you had never seen a phonograph, it would be hard to know which part was missing, let alone what to call it. If you had never seen a bowling lane or lawn tennis… well, you see the problem. … But so long as any group of men attempts to use these tests as funds of information for the approximation of crude and inaccurate generalizations, so long must we continue to cry “Hold!” To compare the crowded millions of New York’s East Side with the children of Morningside Heights [an upper class neighborhood at the time] indeed involves a great contradiction; and to claim that the results of the tests given to such diverse groups, drawn from such varying strata of the social complex, are in any wise accurate, is to expose a fatuous sense of unfairness and lack of appreciation of the great environmental factors of modern urban life (“Intelligence Tests and Propaganda.” Crisis, June 1924; vol. 28, no. 23). The reminders of the three-tiered system are everywhere. At the school cafeteria, Kennedy administrators have created two lines with separate entrances – one for black- and gold- card holders, and another for white-card holders. Because the school has more white-card holders, the white-card-holder line is typically longer, students say. In addition, black- and gold-card holders are known for crowding up to the front of the white-card-holder line and pushing their way inside, without waiting in any line at all, students say. On a recent day, the line was unusually long, and so many students were cutting that Lindeman gave up and didn’t eat, he said. Lindeman’s mother, Peggy, said her son has a learning disability that prevents him from scoring well on standardized tests, making the color-coded ID cards a particularly bitter pill to swallow. A student with a learning disability finding that his identity and test score mean less access to food at school should be enough for any compassionate person to say this program needed to end immediately. It should never have started in the first place. If the goal of raising test scores is worth pursuing with rewards (and I would argue it isn’t), then at least spend the time to find an appropriate choice that does not directly harm other students. 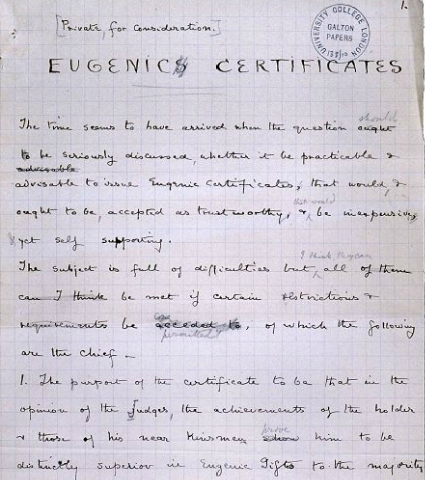 A summary of eugenic goals in The Eugenics Archive at Cold Spring Harbor states that eugenicists, “encouraged reproduction of the ‘best and the brightest’ and discouraged reproduction of the ‘unfit. '” Another section of the same website notes that eugenicist “sought ways to popularize what they considered to be good marriages. Francis Galton [the originator of eugenic theory] urged the brightest and the healthiest individuals to marry each other.” In his private notes (now in the Cold Spring Harbor Eugenics Archive), Galton went a step further and suggested that a man aged 23-30 might be issued a eugenic certificate that would “prove him to be distinctly superior in Eugenic Gifts.” The American Eugenics Party took that idea public and urged the creation of a formal classification system to ensure marriage among suitable mates. Galton’s handwritten notes, from the Cold Springs Harbor Eugenics Archive. Kennedy parent Carol Lopp of Buena Park said she has already approached school administrators to express her concerns, especially after she learned that a school administrator jokingly told female students at an assembly that they should aspire to go to dances with black-card holders instead of white-card holders. I am not arguing that the situations are identical – I don’t believe that the administrator supports the American Eugenic Party platform. But where does a joke like that come from, and why does it come up in the context of a dance, and directed at female students? The implication is clear: the higher-scoring students are more suitable social partners, if not more suitable mates. The administrator may not know anything about eugenics or believe in eugenic principles, but he said what a eugenicist would have said, under conditions a eugenicist would have endorsed. I think the eugenic echoes are ringing loudly in this case, and the misuse of tests continues. Federal, state, and local policies clearly use the tests for “ranking and ordering” more than for any evaluative purpose, and these administrators took those rankings towards the extreme. It cannot be argued that they have served any useful educational purpose through the intentional stratification of students in their daily lives on campus, particularly in non-academic interactions. The stated goal of the program is to motivate the students – by perks or by shame – to offer their best efforts. But the reason to coax their best effort out of them was to make the school look better and generate a higher school ranking. And what does it say about the tests and the broader policies we have in place, that students and schools are so ruled by tests students don’t care about? But in the end, the truly disappointing performance does not belong to the low-scoring students. If anyone has been found wanting, it is the school administrators, along with school or district staff who supported this policy, and those who gave tacit approval within or outside the schools. How did it reach a point where discrimination and segregation so reminiscent of our negative eugenic history somehow seemed like a viable means to an unworthy end? Are Kennedy and Cypress high schools truly unique? I hear the voice of my colleague with expertise in this area suggesting that it is merely a matter of degree. We would all do well to take a closer look at the policies in our school systems, our underlying assumptions about the purpose of schools and education, and the patterns of who receives the best of our efforts and resources, and whom we’ve left behind. I’m calling on all of us to hear the echoes of history and accelerate our progress away from that past, until the echoes fade beyond recognition. We do not have to reduce children and schools to scores and indexes, and we certainly do not have to compare the results of these narrow measures, declare winners and losers, and dole out unearned rewards and counterproductive punishments. Not comparing and ranking? Now that would be a bold paradigm shift towards innovative education reform worth pursuing. At the moment, we are so steeped in grading and measuring and ordering and comparing that what I’m suggesting will be dismissed as naïve and idealistic by many readers. I am not suggesting that we should prop up students’ self-esteem by saying everything they do is fine and all work is equal. I believe in holding students to high standards in their work, and I know that real and lasting self-esteem follows from real achievement, meeting real challenges. I don’t accept that grades and rankings are necessary, or even conducive to the goals we hold dear in education. Maybe if enough like-minded educators, parents, schools, colleges, and leaders would be bold enough to question assumptions they’ve lived with all their lives, our education system might evolve, giving up on a race to the top in favor of truly leaving no child behind. “Although many of the students and parents on the two campuses are very proud of the program, we recognize that some students have negatively interpreted some components of the program. Therefore, we are modifying some aspects to address those concerns and ensure that all students feel supported on campus.